However, what we can do is simulate multi-threading, insofar that it gives rise to one of the benefits of a multi-threaded environment: it allows us to run extremely intensive code. This is code which would otherwise freeze-up the browser and generate one of those “unresponsive script” warnings in Firefox. It all hinges on the use of asynchronous timers. When we run repetitive code inside an asynchronous timer, we’re giving the browser’s script interpreter time to process each iteration. Effectively, a piece of code inside a for iterator is asking the interpreter to do everything straight away: “run this code n times as fast as possible.” However the same code inside an asynchronous timer is breaking the code up into small, discreet chunks; that is, “run this code once as fast possible,” – then wait – then “run this code once as fast as possible”, and so on, n times. The trick is that the code inside each iteration is small and simple enough for the interpreter to process it completely within the speed of the timer, be it 100 or 5,000 milliseconds. If that requirement is met, then it doesn’t matter how intense the overall code is, because we’re not asking for it to be run all at once. How Intense is “Too Intense”? Normally, if I were writing a script that proved to be too intensive, I would look at re-engineering it; such a significant slowdown usually indicates a problem with the code, or a deeper problem with the design of an application. That might be the best solution in a given case; perhaps some processing in an application needs to be moved to the server-side, where it has more processing power to work with, generally, and a genuinely threaded execution environment (a web server). Straightforward enough, for sure. But matchAll() itself is pretty intense, having – as it does – to parse and evaluate any CSS1 or CSS2 selector, then walk the entire DOM tree looking for matches; and the extension does that for each individual selector, of which there may be several thousand. That process, on the surface so simple, could be so intensive that the whole browser freezes while it’s happening. And this is what we find. Locking up the browser is obviously not an option, so if this is to work at all, we must find a way of making it run without error. Now let’s run that code in Firefox (in this case, Firefox 3 on a 2GHz MacBook) … and as expected, the browser UI freezes while it’s running (making it impossible, for example, to press refresh and abandon the process). After about 90 iterations, Firefox produces an “unresponsive script” warning dialog. If we allow it to continue, after another 90 iterations Firefox produces the same dialog again. Safari 3 and Internet Explorer 6 behave similarly in this respect, with a frozen UI and a threshold at which a warning dialog is produced. In Opera there is no such dialog – it just continues to run the code until it’s done – but the browser UI is similarly frozen until the task is complete. Now let’s run it in again … and this time we receive completely different results. The code takes a while to complete, sure, but it runs successfully all the way to the end, without the UI freezing and without warnings about excessively slow scripting. So you see, although the work we can do on the inner process is still minimal, the number of times we can run that process is now unlimited: we can run the outer loop basically forever, and the browser will never freeze. That’s much more like it – we can use this in the wild. I’ve already mentioned one example where I had to find a way for heavy scripting to work; it was either that, or the whole idea had to be abandoned. If you’re not convinced by that answer, then the rest of the article may not appeal to you either. What I’m talking about here is the code required to understand the rules of a game, which can then evaluate situations and tactics in order to try to beat you at that game. Complicated stuff. To illustrate, I’m going to look at a project I’ve been developing on the side for a little while. By “little while” I mean three years, the majority of which was spent at a plateau where the game theoretically worked, but was too intense to use … until I thought of this approach. 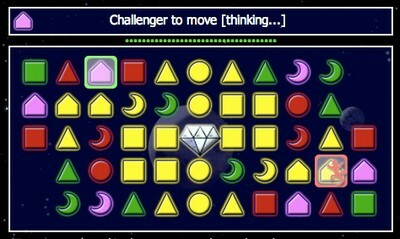 The game is a competitive puzzle based around color- and shape-matching. To summarize: you make your way across the board by adjacent shape- and color-matching. For example, if you start on, say, a green triangle – then you can move to any other triangle, or any other green shape. Your objective is to reach the crystal in the middle, then take it to the other side of the board, while your opponent tries to do the same. You can also steal the crystal from your opponent. So, we have logical rules determining movement and we can also see tactics emerging. For example, to avoid having your opponent reach the crystal, or stealing it from you – you might select a move that blocks them, or try to finish at a place they can’t reach. We evaluate a tactic, and if that gives us a good move then we’re done; otherwise we evaluate another tactic, and so on, until we either have a move, or conclude that there isn’t one and we have to pass. Each of those tactic functions runs an expensive process, as it has to evaluate every position on the board, as well as potential future positions, possibly many times each in light of various factors. The example only has three tactics, but in the real game there are dozens of different possibilities, each one expensive to evaluate. Any one of those evaluations individually is fine, but all of them together, run consecutively, make for an overly intense process that freezes the browser. This code is significantly more verbose than the original, so if reducing code size were the only imperative, this would clearly not be the way to go. But what we’re trying to do here is create an execution environment with no ceiling, that is, a process that doesn’t have an upper limit in terms of complexity and length; and that’s what we’ve done. This pattern can be extended indefinitely, with hundreds or even thousands of tasks. It might take a long time to run, but run it will, and as long as each individual task is not too intense, it will run without killing the browser. That checksomething() function will always return false because the inner function is asynchronous. The outer function will return before the first iteration of the inner function has even happened! We’re out of the scope of the outer function, therefore we’re unable to return from it; that return value disappears uselessly into the ether. Elegant? No. But robustly functional? Yes. And that’s the point. Using this technique, we can write scripts that would otherwise be impossible. Do Androids Dream of Silicon Sheep?